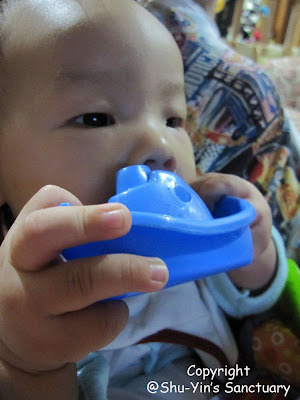 Everything that he can grab goes straight into his mouth. Immediately. Many of his toys were taken from him because the paint may come out and it may be toxic, especially those with 'made from China' labels. 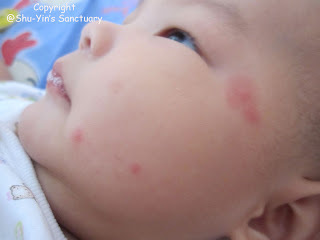 We woke up one morning and we saw Shern's face full of red spots - mosquito bites. There were more than 10 spots on his face. His right ear alone had 5 red spots. Shern looked so pitiful. How itchy and painful he must have felt. My heart ached for him. Damn those mosquitoes. Immediately went to Wellings Parmacy to buy some medicine for him to apply. 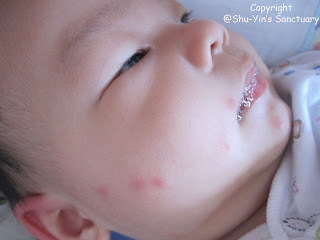 Also bought Moz Away Mosquito Repellent Spray which is safe for baby use. Shern's attention span is real short. Max 15 minutes and he gets bored. 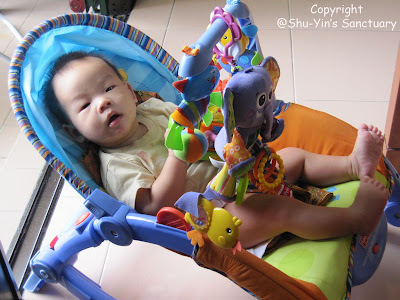 Look at his many toys hanging on top of his rocker. 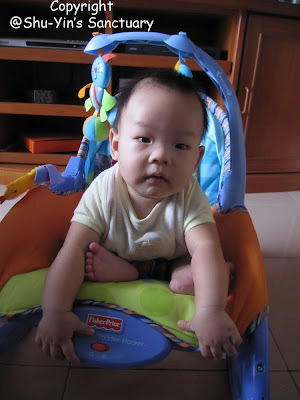 It is a definite must to buckle Shern up whenever we put him in his rocker. Look how strong he is. 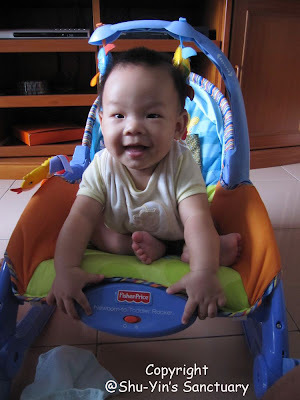 He can kinda sit up and if he is not being buckled up, he will surely fall forward. 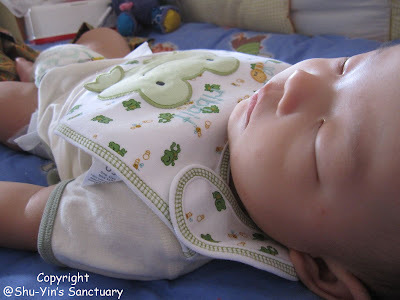 Shern could not sleep for long when being put down in his baby cot during day. Max 1 hour. The moment he realized he is being put down in his cot, he makes noise. Then we need to carry him up and rock him back to sleep before we put him down again. Ahhh....I really don't know how to train him to sleep back when he wakes up. 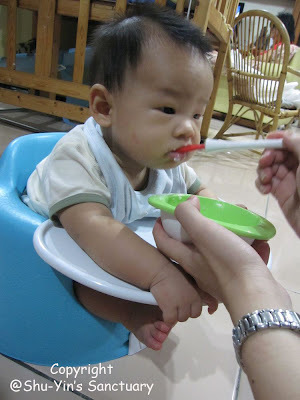 He seemed to love his solid food and would finish a small bowl of it in less than 15 minutes - very fast considering that his spoon is so small. Many mouthfuls indeed. We took Shern out for a short dinner at Sri Ananda Bahwan, Tg Bungah. It was just a 2 minutes' drive away from our place. Shern made lots of noise and wanted to be carried. He did not want to be strapped to his stroller. 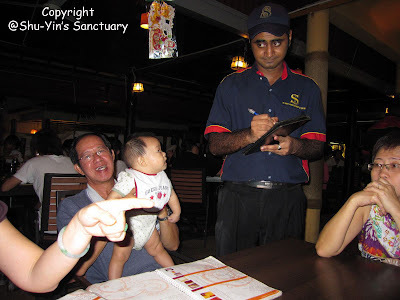 Look at him looking curiously at the waiter taking orders from us? 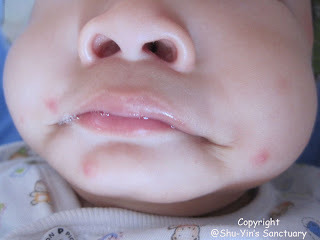 oh no the mosquitoe bites! bad, bad mosquitoes!!! yeaps. shern did not have a problem with mosquitoes til now.